The EasyCell® assistant is a state-of-the-art hematology system that uses image-processing and pattern-recognition technologies to automate white cell differentials. EasyCell automatically locates white cells on a blood smear, preclassifies the cells, and then presents them to a technologist for review on an LCD display. The hematology system typically reduces sample review times by 50% over the manual differentiation method using a microscope while helping the technologist achieve improved efficiency, accuracy, and precision. Additionally, EasyCell presents images of red cells and platelets for performance of red cell morphology and platelet estimate. EasyCell assistant employs sophisticated optical pattern recognition software to automatically locate and preclassify normal white blood cells, smudge cells, NRBC’s, and variant lymphs. 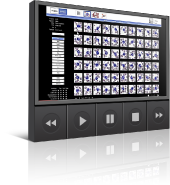 Images of these cells are then displayed and grouped on the display by cell type for confirmatory review. The system then locates and displays abnormal white cells and places them in an “Other” category so the technician can manually classify them. Technologist attended time required to review each slide is reduced from 5 to 8 minutes to 2 minutes or less! EasyCell performs consistent WBC cell location and pre-classification and is especially helpful to less-experienced technicians. 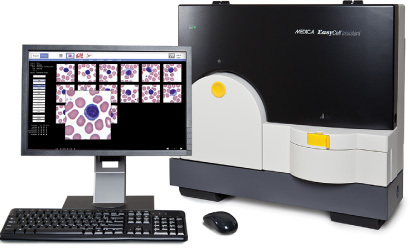 Image review or image transmission to other laboratories for consultation is possible because digital images of each cell are permanently stored. View how the system operates and performs.